A rupture in the crust of a highly magnetized neutron star, shown here in an artist's rendering, can trigger high-energy eruptions. Fermi observations of these blasts include information on how the star's surface twists and vibrates, providing new insights into what lies beneath. 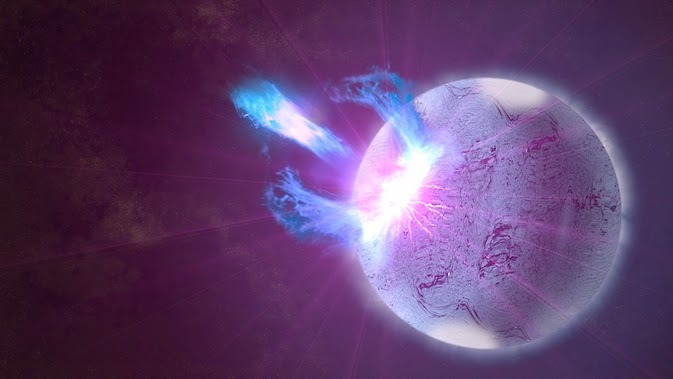 NASA's Fermi Gamma-ray Space Telescope detected a rapid-fire "storm" of high-energy blasts from a highly magnetized neutron star, also called a magnetar, on Jan. 22, 2009. Now astronomers analyzing this data have discovered underlying signals related to seismic waves rippling throughout the magnetar. Such signals were first identified during the fadeout of rare giant flares produced by magnetars. 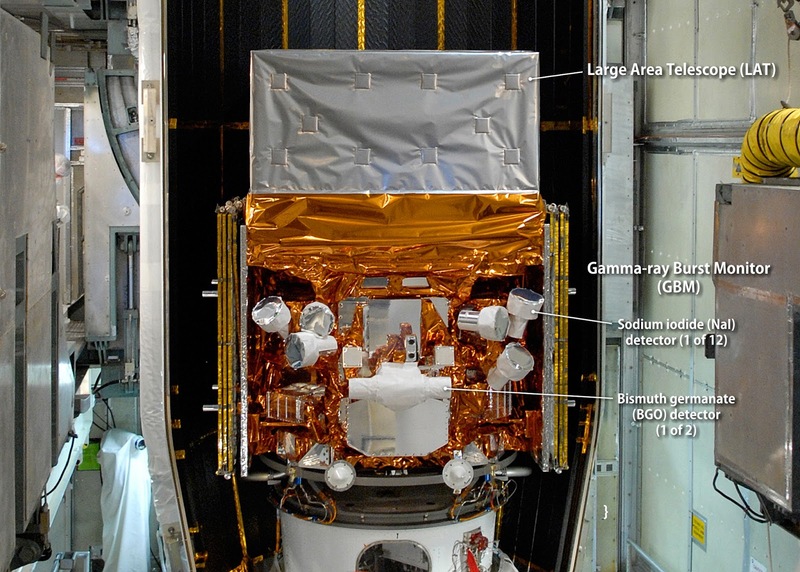 This image of NASA's Fermi Gamma-ray Space Telescope, shown here in May 2008 being readied for launch, highlights the spacecraft's instruments. The Gamma-ray Burst Monitor (GBM) is an array of 14 crystal detectors sensitive to short-lived gamma-ray blasts. Over the past 40 years, giant flares have been observed just three times, in 1979, 1998 and 2004, and signals related to starquakes, which set the neutron stars ringing like a bell, were identified only in the two most recent events. "Fermi's Gamma-ray Burst Monitor (GBM) has captured the same evidence from smaller and much more frequent eruptions called bursts, opening up the potential for a wealth of new data to help us understand how neutron stars are put together," said Anna Watts, an astrophysicist at the University of Amsterdam in the Netherlands and co-author of a new study about the burst storm. 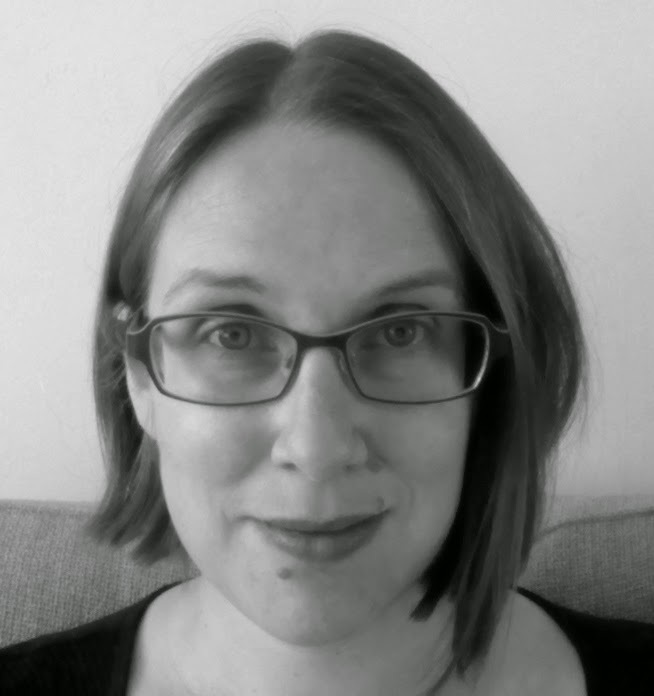 "It turns out that Fermi's GBM is the perfect tool for this work." In the midst of SGR J1550-5418's 2009 burst storm, Swift's X-Ray Telescope captured an expanding halo produced by the magnetar's brightest bursts. The rings formed as X-rays from the brightest bursts scattered off of intervening dust clouds. Clouds closer to Earth produced larger rings. Neutron stars are the densest, most magnetic and fastest-spinning objects in the universe that scientists can observe directly. Each one is the crushed core of a massive star that ran out of fuel, collapsed under its own weight, and exploded as a supernova. A neutron star packs the equivalent mass of half-a-million Earths into a sphere about 12 miles across, roughly the length of Manhattan Island in New York City. While typical neutron stars possess magnetic fields trillions of times stronger than Earth's, the eruptive activity observed from magnetars requires fields 1,000 times stronger still. To date, astronomers have confirmed only 23 magnetars. Because a neutron star's solid crust is locked to its intense magnetic field, a disruption of one immediately affects the other. A fracture in the crust will lead to a reshuffling of the magnetic field, or a sudden reorganization of the magnetic field may instead crack the surface. Either way, the changes trigger a sudden release of stored energy via powerful bursts that vibrate the crust, a motion that becomes imprinted on the burst’s gamma-ray and X-ray signals. It takes an incredible amount of energy to convulse a neutron star. The closest comparison on Earth is the 9.5-magnitude Chilean earthquake of 1960, which ranks as the most powerful ever recorded on the standard scale used by seismologists. On that scale, said Watts, a starquake associated with a magnetar giant flare would reach magnitude 23. Our Pale Blue Dot, Our Island EARTH!